Read the latest news from English Bridge Education Development and its community. Read all about English Bridge Education and Development and its aims and objectives. 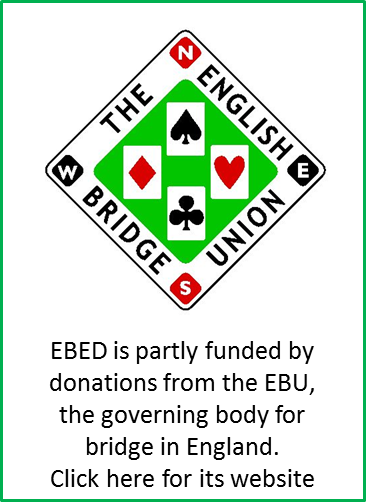 English Bridge Education & Development (EBED) is a newly formed charity registered with the Charity Commission. The charity has two public benefit objectives: the furtherance of duplicate bridge as an activity which enriches the life of all, and, secondly, a specific aim to foster duplicate bridge among those in full-time education. We believe that bridge brings with it important benefits in terms of fostering social interaction, as well as supporting the use of mathematical reasoning and the application of logic.